Moon plays Nightshop in downtown Bloomington on Friday, Nov. 16. Moon, from left, is Christopher Schneberger (drums), Chris Shen (bass), and David Azizinamini (guitar, vocals). GLT caught up with drummer Chris Schneberger via Skype and discovered the ardent Rush fan was interviewed for the Netlix documentary “Beyond The Lighted Stage” at his first Rush fan convention. Two short clips ended up in the movie. “I went kind of thinking, ‘Oh this will be a laugh. I like this band … I’m going to see them in their hometown of Toronto … that will be a lot of fun.’ And I didn’t wear a Rush shirt, which I found out was illegal at a Rush convention,” laughed Schneberger. Mr. "Indie-Rock Cool Guy" realized quickly that instead of going to chuckle at all the Rush geeks, he too was a Rush geek to the core, and ended up having a lot of fun. “It was kind of like going to a group therapy,” he chuckled again. “I was among my kind that shared the same affliction, and we could share that with each other." A short listen to Moon’s music quickly reveals their influences. Though vocalist David Azizinamini sings in a high register similar to Geddy Lee of Rush, his sparse lyrics tend to float over and stretch with Moon's music compared to Lee reciting Neal Peart's epic novels. Asked to define what Rush critics are missing, Schneberger declined, instead focusing on the three qualities he admires in the Canadians' music. That sound permeates Moon’s new album “Extinction.” The heavy gurgling groove on "Revolutions" underscores the steady, higher pitched vocals of Azizinamini. 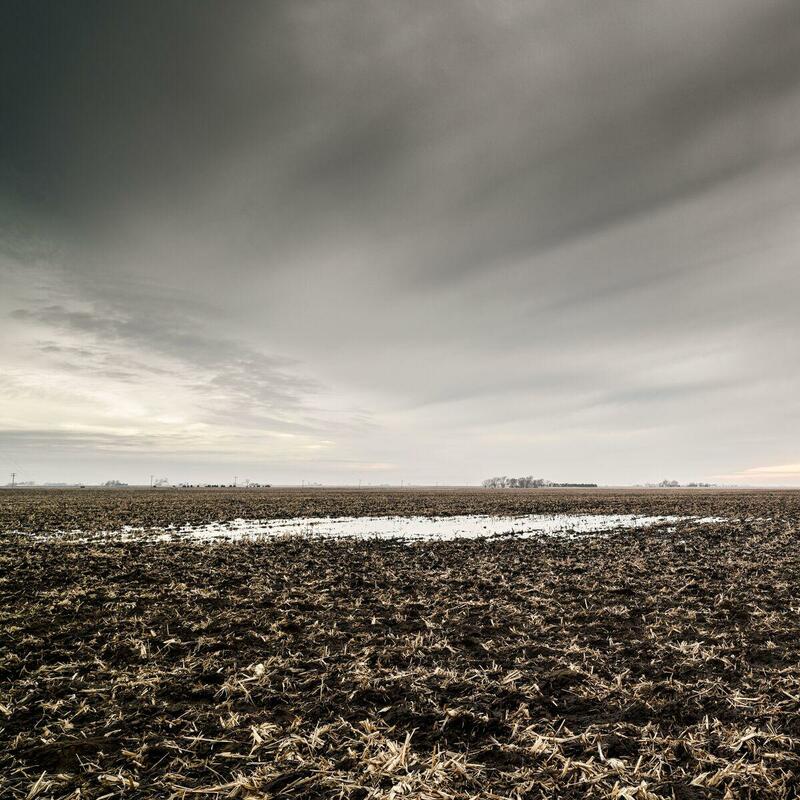 Schneberger said the album name and accompanying stark album cover image of a barren, just harvested crop field recovering from a late fall rain shower foreshadows the bleakness to come. The album artwork is Schneberger’s. By day he’s a professor of photography at both Columbia College in Chicago and the suburban College of DuPage in Glen Ellyn. (Sidenote: The Schneberger curated 2018 State of the Art Photography Invitational at Parkland College in Champaign runs through Feb. 5). He has focused on rural Illinois farmscapes for the past few years, with rural Paxton along Interstate 57 just north of Champaign-Urbana of particular interest. Azizinamini’s vocals are often buried deeply enough into the mix that discerning them is difficult, even for Schneberger. “And David doesn’t generally make it a habit to write them down for us,” Schneberger laughed. “I can’t speak for David, but when I hear that lyric, I think of school shootings and other things that seem to be a bleak future for the youngest generation and the possible loss of that innocence,” said Schneberger of the vocals buried in a swirling rock that segues into a crunchy guitar that evokes an almost orchestral warlike anthem. “It’s discovering some kind of luminosity in one’s life, and finding there is hope, there is a light and something to be celebrated,” said Schneberger of the song, before returning to the three qualities he appreciates in the music he loves: heavy, propulsive, and melodic. An excerpt of the interview with Chris Schneberger. The complete interview with Chris Schneberger.